This vegan tomato soup reminds me of my wife. Say it loud, stay it proud, folks–I married a ginger! So, yes, part of the association between Shae and this soup is its color. The fresh tomato base,lends a natural red-orange tint, whereas most tomato soups are crayon red from canned tomatoes. But this soup is a redhead for more than its color. It also captures what we will call “the spirit of the redhead.” You know what I’m talking about. Vibrant, energetic, and quick tongued. This soup bursts with tomato tang flavor and richness and will add a new dimension to a very traditional soup recipe. So next time the redhead in your life (rightfully) complains about the lack of ginger emojis, invite ‘em over for dinner to let them know you’re in their corner. No canned tomatoes here, folks. This recipe is all about freshness without sacrificing simplicity. Chop an onion and garlic and cook for a few minutes, stirring frequently. Chop a ton of tomatoes and add them to the frying pan. Cook until they soften up a bit. Add the mixture to a food processor, toss in fresh basil, salt, and freshly cracked pepper, and blend until the desired consistency is reached. Boom! Vegan tomato soup from scratch. Most people typically expect tomato soup from a can or box if they’re not at a restaurant, so this is a super easy way to impress folks or make someone feel loved. 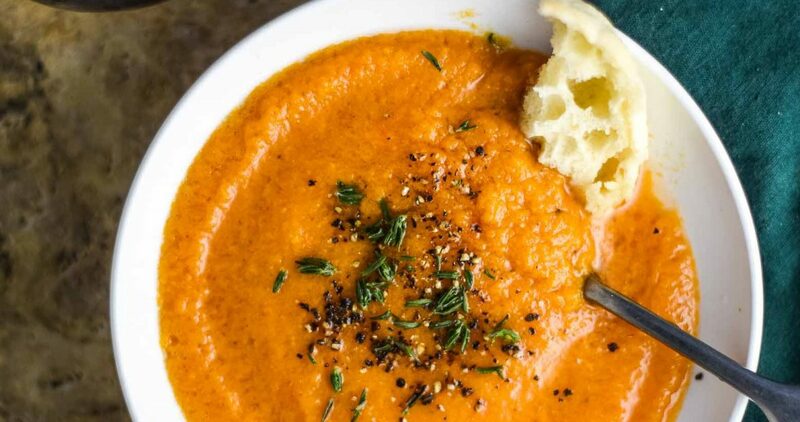 what kind of tomatoes are best in homemade tomato soup? You can try all different types of tomatoes with great results. I used beefsteak tomatoes, but cherry, grape, roma, or heirloom would also be great with this recipe. 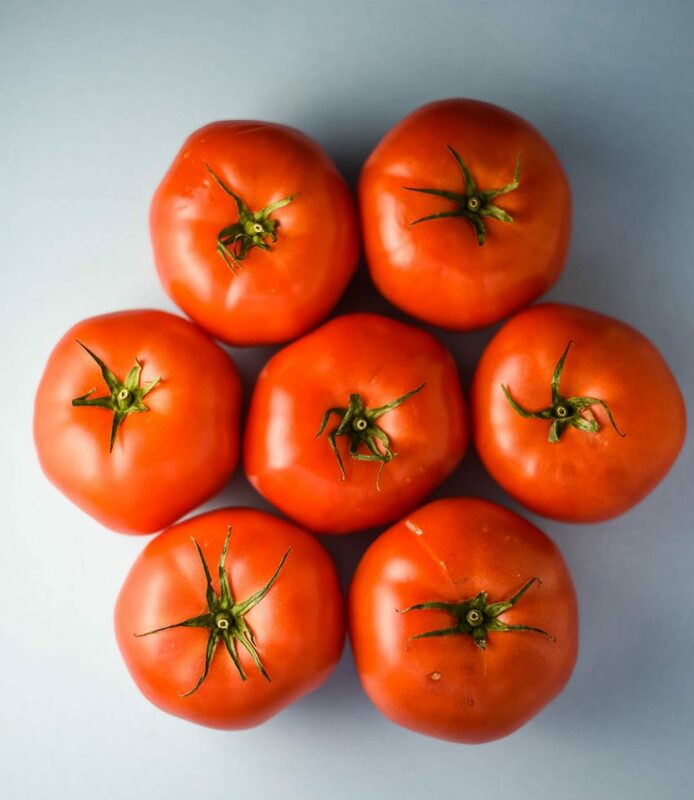 Keep it simple by picking the tomatoes that look the most fresh and delicious. 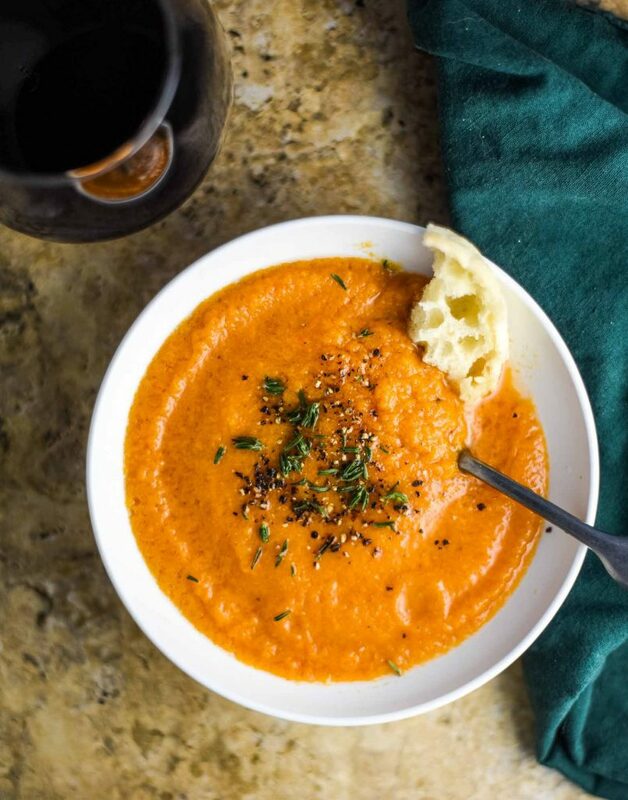 what do you serve with vegan tomato soup? Easy question, easy answer. You have plenty of options here.. Bread of any sort is great for dipping – try sourdough or focaccia for a delicious combination. Pita chips are also a solid choice, and A side salad can can keep it light while upping the healthy factor. But my personal favorite? Wine, of course. Specifically, red wine (no, not to match the tomatoes) to hold up against the tang of the tomatoes. Keep scrolling for more details. Looking for some more soup ideas? Check out my broccoli soup, mushroom lentil soup with kale, moroccan chickpea stew, and vegan asparagus soup. 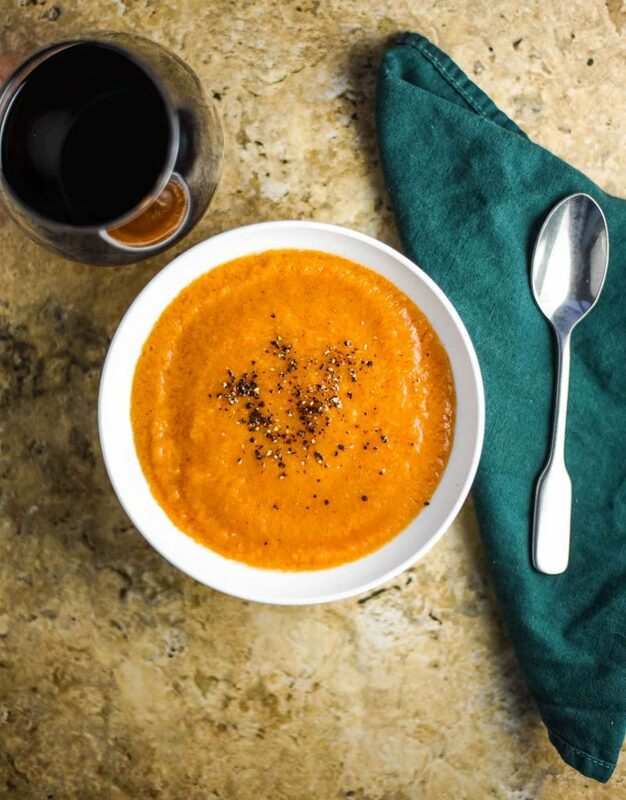 If you make this vegan tomato soup and drink some wine, let me know how it goes. Leave a comment, rate it, and don’t forget to tag a photo #plantandvine on Instagram. Chianti Classico: tomato soup demands a zesty, earthy wine to complement its rustic simplicity. Chianti Classico, which is made from the Sangiovese grape, fits the bill with its high acid, tomato, olive, leather, and strawberry flavors. Barbera: if you’d like an Italian red with a little less acidity and tannin, Barbera is a great choice. It is slightly more fruity and less savory than Chianti if that’s your speed. Cabernet Sauvignon: if you’re thirsty for a bold red wine, Cabernet Sauvignon has the acidity to handle the tang of this soup. Make sure you have bread on hand to soften and contrast the wine and soup pairing. You’ll also want one that has aged a bit so its tannins have softened. Want to learn more about wine pairing techniques? Check out my wine pairing guide and guide to vegan wine for more ideas. Or, if you already have a bottle of wine and need the scoop on how to decant, check out the best wine decanters. 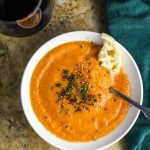 Homemade vegan tomato soup recipe that uses fresh tomatoes, onion, garlic, and basil for the flavor. Delicious and healthy. Heat a large frying pan or soup pan over medium heat. Add the olive oil. When oil is warm, add the onions and garlic and cook for 3-5 minutes, stirring occasionally, until slightly softened. Add the chopped tomatoes to the pan. Cook over medium heat about 5 minutes, stirring occasionally, until the tomatoes are soft. Remove from the heat. Put cooked vegetables, fresh basil, salt, and pepper in a food processor (I used my Vitamix) and blend on high until smooth. To serve, top with additional fresh herbs and bread for dipping. *Recipe is a guide. Adapt as desired. Inspired by A Virtual Vegan.